Luz, Ulrich. Matthew 8–20: A Commentary. Edited by Helmut Koester. Translated by James E. Crouch. Hermeneia. Minneapolis: Fortress, 2001. This is the second volume of Hermeneia’s three volume Matthew commentary. 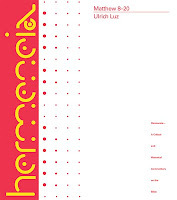 This three volume series is based on Luz’s original German four-volume commentary. For the first volume, Matthew 1–7, see here. This is the second of a three-volume commentary on the gospel of Matthew from Europe's leading Matthew scholar. Volume 1 Matthew 1–7 was previously published in the “Continental Commentaries” series. Luz’s commentary is especially noteworthy, not only for his incisive exegesis, but also his keen eye for the importance of the history of interpretation and his attention to the relevance of the New Testament for contemporary Christian ethics. This commentary includes excursuses on Son of David; Matthew’s Interpretation of the Parables; Peter in the Gospel of Matthew; and Son of Man.